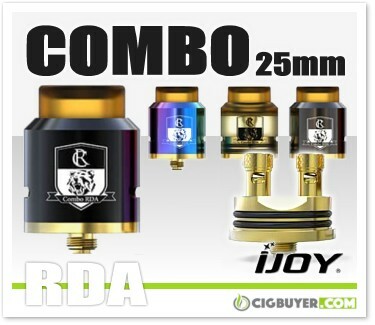 IJoy Combo 25mm RDA – ONLY $13.49!!! Check out what we just spotted on the clearance shelves at US vendor Vapor DNA – the IJoy Combo 25mm RDA for only $13.49! The IJoy Combo RDA features a unique, screwless two-post design where you simply press down on spring-loaded post mechanism and insert your coil leads. The deck is 24K gold-plated for superior conductivity, and a 9mm juice well provides plenty of e-juice capacity. Airflow is delivered via dual adjustable bottom airslots and it comes with a 10mm wide bore 810 ultem drip tip, a set of prebuilt coils and a special post compression tool to assist building.